A dynamic & durable mirror design in stainless steel. Kaleido pattern is permanently frost etched into 55% of the polished mirror surface. About 45% of the mirror surface remains reflective. 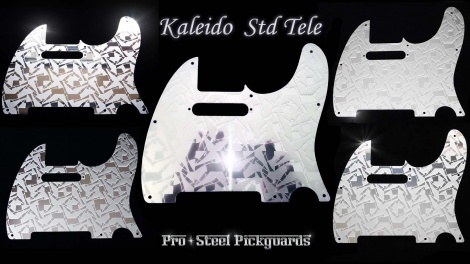 This Kaleido is now available in other Fender Guards. Squier Tele's: Will fit recent Squier Telecasters. If a standard Fender Tele guard fits, then this guard will fit and you've got a Mirror Tele.